Currently browsing posts filed under "North Adams"
A slew of projects, starting to roll in this summer with the mayor’s support, promises a leap forward, further changing North Adams into a destination for art and performance, accommodation and food. It may be a turning point for a city that’s dealing with population depletion, high unemployment and addiction rates and empty storefronts that starkly contrast with the well-heeled Williamstown, home to Williams College, right next door. Read the whole thing. There is a great senior thesis to be written about the rise of North Adams as a cultural destination. Who will write it? And there’s much more in the pipeline for North Adams. Though clearly ambitious, the ventures under construction this summer are a fraction of the city’s proposed master plan, a grand scheme to build a “cultural corridor” that’s currently outlined in blueprints and feasibility studies, featuring at least four new museums along with a distillery and “art hotel,” both designed by Jean Nouvel. It’s all the brainchild of Thomas Krens, who hatched the original idea for Mass MoCA before moving to New York in 1988 to run the Guggenheim for almost 20 years. Is there an alum who has had more of an impact on the local area than Krens? If so, who? I live on the outskirts of a land of big old money and gorgeous old houses and muted sweater sets and kitten heels and zealous committees and no visible midlife crises. I imagine I would be amazed by what goes on behind closed doors in the town next door. It is a glossy postcard of a place. I live on the wrong side of the tracks, to be sure. Property values here are about a third, sometimes a fourth, of the values of very similar houses on the “right” side of the tracks. But the landscape is rougher here, spottier. We don’t have driveways or garages, so we pull our vehicles haphazardly up on the curb in the winter. When I am in the right mood, the juxtaposition of the two towns—one home to the most expensive liberal arts college in the country, the other mentioned frequently over the past few decades as one of the Top Ten U.S. towns for teen pregnancy—is fascinating. We need a show like “South Park” to highlight the quirks. There would be a busy, cheerful border patrol, selling cupcakes and offering unusable financial advice to the unfortunates on the “Mexico” side. 401K advice is not helpful when you have 401 dollars to your name. Read the whole thing. There is no better writer in all of Eph Planet. Two new restaurants opening in North Adams: Rub (which sounds awesome), a bourbon and BBQ joint, and Sushi House which is, well, a sushi place. Hopefully a few Ephs will make the (short) trek over and check them out. Eph dorks (perhaps that is redundant) take note: the Western Gateway Heritage State Park in North Adams has a nice series of events planned for January honoring “fathers of science fiction” Jules Verne and H.G. Wells. Check out the event schedule here. Your next home base in the Purple Valley? 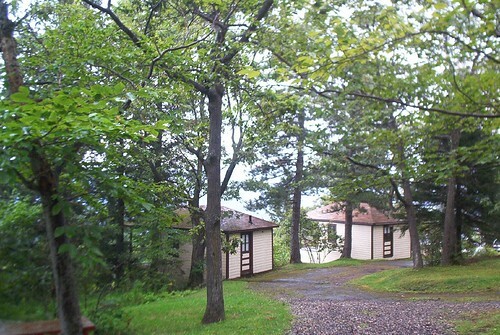 Do you recognize these accommodations? For decades, the Wigwam Cottages and associated gift shop have sat astride Route 2, high above its famous Hairpin Turn and featuring a terrific view of North Adams, Williamstown, Pine Cobble, and the Taconics. Although most Williams students and alumni have probably driven past dozens of times, I’d wager few have ever been inside the gift shop, let alone one of the cottages. (Although I have). For the last couple of years, however, the Wigwam has been closed. But good news is on the horizon: the site has been bought and will be refurbished — by Berkshire business mogul Nancy Fitzpatrick, owner of Stockbridge’s luxurious Red Lion Inn and MassMOCA’s Porches Inn. Phew! No more keeping it a secret! We have a fun new project to share with you all – The Wigwam Cabins, located along the Mohawk Trail in North Adams, just 5 miles from Porches. These 1930s gems are ours to lovingly restore, and we can’t WAIT to get going on it! Comments Off on Your next home base in the Purple Valley? Be sure to support both MassMoca and the Clark, each of which has advanced to the second round of America’s favorite art museum contest. The Way Out, the new CD from The Books (based in North Adams, and featuring Eph Nick Zammuto ’99), has received “universal acclaim” according to Metacritic. The Books are definitely not everyone’s cup of tea, but they create a lot of interesting soundscapes. Listen to the new album here. Speaking of The Books, they will be performing at the can’t-miss music event of the summer in North Adams, the Wilco-curated Solid Sound Festival, which runs from August 13-15. Leonard Nimoy has an intriguing new exhibit at MassMoca. Joseph Thompson ’81 is quoted at length in this NYTimes article discussing the exhibit and Nimoy’s career as an artist. WCMA commissioned an interesting installation (which is housed in a vacant North Adams car dealership) by Pepon Osorio, Drowning in a Glass of Water. Darlingside, comprised of recent Eph grads, continues to produce great music. You can purchase their LP or see their tour dates here. North Adams’ annual Downstreet Art exhibition series appears to be bigger and better than ever this summer. Even City Hall is getting in on the burgeoning North Adams art scene. John Sayles ’72’s latest film, Amigo, is in post-production. Sayles has a blog chronicling the making of the movie. See the teaser trailer here. The Wilco Solid Sound Festival will be held August 13-15 at MassMoca. Tickets go on sale Friday. Kind of a bummer that the biggest pop music event in who-knows-how-many years in the Berkshires is occurring when very few students will be in town … still, this is a major coup for MassMoca, and for North Adams in general. If you aren’t familiar with Wilco, you should be. Yankee Hotel Foxtrot is inarguably one of the ten best albums of the aughts. First and foremost, almost anyone who has made a trip into the valley of death and despair (aka Amherst) to watch Williams triumph in a sporting event vs. the Lord Jeffs has stopped at Antonio’s Pizza at some point. Well, now it appears that North Adams is getting its own version of Antonio’s, Supreme Pizza and Wings. And with that, the only reason to choose Amherst over Williams has been eliminated … and don’t forget, Petrino’s Cafe opens today in North Adams (in the former Cup & Saucer Space). Mezze’s Water Street location has closed, and they have moved to the former Le Jardin space. Any rumors on what might take Mezze’s place? It is an absolutely gorgeous restaurant space, and obviously a fantastic location that should only get better when Water Street is finally renovated to become more pedestrian friendly and integrated into the Spring Street business district. The Blackinton Mill (located near the Williamstown / North Adams border) redevelopment, which was a victim of the tough economic climate, appears to be back on track under a new developer, albeit in slightly different form (mixed used vs. solely residential). This is a fantastic building in a spectacular setting, so I’m glad to see that, if all goes well, it will be put to good use. North Adams and Williamstown are blessed with a tremendous volume of amazing former mill spaces (some of which is currently available for a potential brew pub), including the Cable Mills development, which upon completion should revitalize Water Street and bring a lot more foot traffic to a street that at times feels like an afterthought (making it more pedestrian friendly and adding parking per the current initiative should also help tremendously). This is a bit dated, but hasn’t been mentioned on this blog before. This fall a new Williamstown bakery opened, the AFrame Bakery near the intersection of Routes 2 and 7 (by the Berkshire Hills motel). Based on this Record review, sounds like it is definitely worth a visit. Angelina’s Sub shop closed (the article is no longer available, but I believe there was some discussion of a potential replacement). Big news for North Adams as well, as former Williams employee Mark Petrino will be opening up the awesome-sounding Petrino’s Cafe in the former Cup & Saucer space. If all of these venues live up to their promise, Williamstown and North Adams will feature an enviable wealth of casual dining options, especially for a fairly rural area. For those too new to campus to know much about the old Pub, you can read more here and here. Here is the WSO thread discussing the new pub. Berkshire Eagle reports on the start of an awesome new tradition in the Fall Foliage Festival: “Two eating contests are sceduled for the afternoon on Oct. 3. First up is a beginning of a college rivalry as Massachusetts College of Liberal Arts versus Williams College in the first annual Jack’s Hot Dog contest at 2 p.m.” For those not in the know, Jack’s maintains a “chart of champions” for those brave enough (and with a stomach strong enough) to attempt to eat sufficient volume of dogs to earn acclaim. I recall during my undergrad years future-NFL’er Ethan Brooks consuming just an insane volume of dogs. Is there a hot-dog lover on campus today who can approach Kobayashi’s level of achievement? We’ll soon find out. For more on Jack’s storied history, check its website or read this article. The expansion of MassMoca is not to be missed: the architecture is incredible, and the Lewitt exhibit is, for the first time, a permanent installation that can even trump the breathtaking space housing it. Here are some pictures, concluding one of the author for those brave enough to venture below the break. Looking for inexpensive, basic food in North Adams? 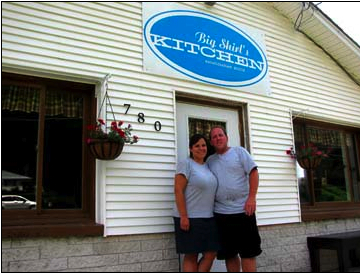 Try Big Shirl’s Kitchen on Massachusetts Avenue, which has just opened in the old bus company building. If you go, let us know how it is. It sounds like a great place to take a car filled with current Ephs. More here. This weekend, MassMoca celebrated its ten year anniversary. Its impact on the region, and on North Adams in particular, can not be overstated. 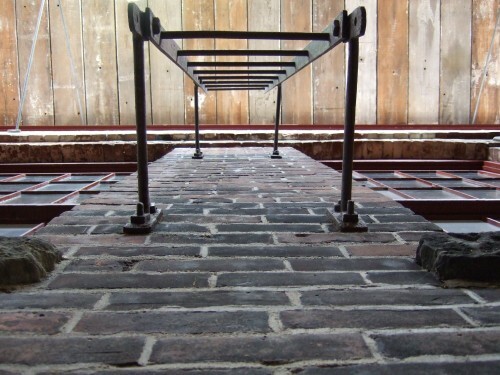 Without MassMoca, there is no Porches Inn. There is no Gramercy Bistro or Taylor’s Fine Dining. There is likely no stadium style movie theater in North Adams. There would not be a viable future for a restored Mohawk Theater. There certainly would not be a DownStreet Art gallery tour, an initiative that has turned a bad economy into a positive local enterprise by doubling its utilization of vacant downtown space in just one year. (It’s just a shame that all of the MassMoca-spurred development occurred subsequent to the criminally stupid “urban renewal” that destroyed much of North Adams’ historic downtown in favor of a strip mall …). Kudos to MassMoca founder Thomas Krens ’69 and founding (and current) Director Joseph Thompson ’81, two Ephs who had the vision to see something spectacular where everyone else just saw blighted, abandoned factory buildings in a town decimated by industrial upheaval. 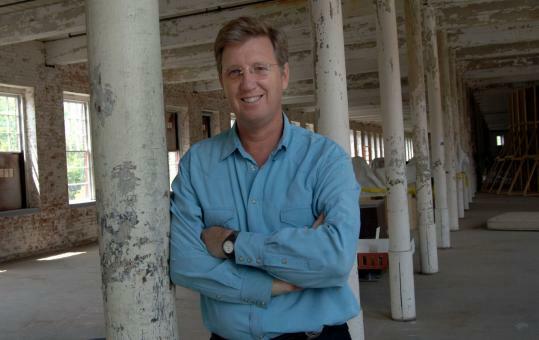 It is a testament to the strength of their vision that, only ten years later, the notion of repurposing industrial buildings in blighted or rural communities as a means of economic revitalization has become almost trite. And MassMoca continues to be a pioneer: with its recent highly-regarded Sol Lewitt installation, its partnership with the Clark, its continued integration of commercial and municipal space into its complex, its outreach to kids, and its environmental initiatives. All in all, the museum is arguably the largest contribution Williams and its alumni have made to the greater Berkshire region in recent memory. Today’s New York Sun features a lengthy article on the Clark expansion, including a nice slide show of the new Stone Hill Center. Meanwhile, North Adams is keeping up with the neighbors, creating a new art map highlighting various galleries and artist residences around town, and putting the finishing touches on the massive new Sol LeWitt exhibit at MassMoca. There has been a steady trickle of interesting development news coming out of Williamstown and North Adams over the last few weeks. First, Williamstown: This article discusses the future of Water, Latham and Spring streets, as does this one. I really like the vision here. In my view, the most successful (in terms of scale, beauty, context, and utility) recent construction project on or around campus was the B&L building on Spring Street, and I really hope future developments on Spring / Water streets employ that as a model. Using space on Latham street to expand the athletic facilities and add parking makes a lot of sense to me. That area has the rare double of convenient location and low visibility, and therefore seems like a good place to put an eyesore like a garage. Buildings and Grounds will have to be moved in any event to make space for any expansion of the athletic facilities. I also believe that Water Street has a ton of potential (and with the demolition of the town garage, a lot of prime space for commercial development), and making it more pedestrian-friendly, in conjunction with the major Cable Mills condo conversion, will effectively double the Williamstown downtown commercial district and create a lot more residential options without changing the “village beautiful” dynamic or harming the Williamstown landscape. Overall, the impact on downtown will be as dramatic as the impact the current Williams construction boom will have on the center of campus. It is therefore crucial to involve as many constituents as early in the process as possible to figure out what types of businesses will appeal to long-time residents, students, faculty, alums and tourists alike, without dramatically altering the town’s character. Encouraging news also continues to emanate from North Adams. The MassMoca complex continues to fill up, this time with help from the Clark. Anyone have the inside scoop on this collaboration? Sounds intriguing. The Clark, which always seemed sleepy, staid, and boring when I was an undergrad, has certainly been aggressively expanding in both Williamstown and North Adams. Of course, securing a 90 million dollar donation doesn’t hurt its cause. And as MassMoca space continues to fill up, downtown North Adams will continue to benefit. Why does all of this matter to Williams? Well, Williamstown already offers unparalleled natural beauty, in terms of northeast liberal arts colleges. The one area where many of its peers can claim (to prospective students and faculty alike) an advantage is in proximity to diverse social, retail, residential and culinary options. With MassMoca and the Clark rapidly expanding both physical exhibits and programming, with abandoned mill space converting to attractive condos in North Adams and Williamstown alike, with new stadium style movie theaters, minor league baseball, and a renovated Mohawk Theater providing entertainment in North Adams, and with more retail and culinary options in downtown North Adams and Williamstown, that advantage will continue to diminish, if not dissipate entirely. Great NYTimes article on the resolution of a hotly disputed exhibit in the enormous gallery at MassMoca. Even before I reached the last few paragraphs of this article, I was guessing this dispute was fabricated, all part of the experience. Maybe I’ve just seen too much contemporary art. I wouldn’t be shocked if MassMoca was in on it: the tarps practically scream of conceptual art, particularly given the themes of this exhibit. And even if unplanned, the tarps will undoubtedly come to be viewed as part of the art by critics. Speaking of North Adams, the Mohawk will be opening sooner rather than later: should provide another huge boost for downtown. For a great summary of recent changes to downtown North Adams, including photos, read this recent Berkshire Eagle article. Lots of interesting arts news in the Williamstown / North Adams corridor the last few months, none of which (I believe) has yet to be mentioned here. In my view, one of the best things that can happen to the region is a continued influx of artists and museum visitors. Not only because art / artists / art aficionados are cool, but when artists come, interesting cafes, restaurants, and bars tend to follow. 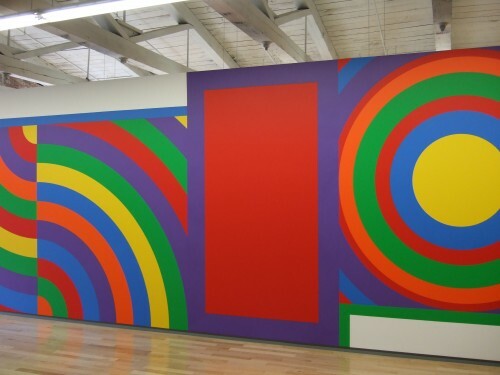 First, Sol LeWitt, creator of the iconic wall drawing in the WCMA, recently passed away. But his legacy will live on for at least the next 25 years at MassMoca, which has commissioned what looks to be a spectacular semi-permanent installation of his enormous wall drawings. Just the sort of art that MassMoca is uniquely positioned to exhibit due to its cavernous, raw spaces, and something which I imagine will attract a lot of visitors to North Adams. Speaking of North Adams, the Contemporary Artists Center recently disclosed a plan to potentially move into the vacant Notre Dame Church in downtown North Adams. Bringing more art and artists downtown while rehabilitating unused historic downtown space seems like a win-win proposition. In less happy news from North Adams (and a cautionary tale about relying too much on artists, who have a tendency to be, ummm, unpredicatable, as an engine for economic growth), an interesting article on a dispute over an installation at MassMoca’s Building Five (which has housed some of the coolest contemporary exhibits I’ve seen, as well as some truly cryptic ones). While I’m on North Adams, a little off the art topic, but I had to mention this. A microbrewery is coming to town!!! I very, very much hope that Cold River eventually expands to become a brew pub feauring food and a bar. There is no equivalent in the immediate area, and I am sure that Williams students and young faculty would prove to be very loyal and enthusiastic customers if the food and beer are top quality. Back to art, one more topic that I’ve heard, strangely, very little about: the Clark’s massive expansion. Is this underway? If so, how does the progress look so far? The plans look spectacular, and I like the idea of another full service restaurant in Williamstown as part of the plans. Finally, the Clark, among other area attractions, gets a mention in this recent NYTimes feature on family activities in the Berkshires. As someone who has recently completed a llama hike in the D.C. area, I highly recommend it for kids and adults alike. EphBlog is powered by WordPress and delivered to you in 1.375 seconds using 41 queries..